Of all the many things there are to love about old school D&D and its clones, I think the one I personally enjoy the most is the ease with which one can modify its rules by cherrypicking good ideas from other games and supplements. Though I play Labyrinth Lord these days, it's a heavily modified Labyrinth Lord, one that borrows rules from a number of different sources. As I play, I continue to modify it, adding whatever I come across that seems to fit my vision of fantasy. That's why I'm a big fan not only of new rules sets but also of supplements, like Kevin Crawford's The Crimson Pandect. Written as a supplement for the excellent Red Tide campaign setting, this 132-page product (available either as a PDF for $9.99, a softcover book for $19.99, or a hardcover for $24.99) is "a handbook of eldritch lore" that's easily adaptable to other settings. Consisting of five chapters plus a brief introduction, The Crimson Pandect provides a plethora of new options for magic and spellcasting in Labyrinth Lord or most any other class-and-level fantasy roleplaying game. The first chapter, "Paths of Power," presents six new magic-using classes. These classes are astromancers, the Kuan Amelatu, Makerite theurgists, adepts of the Mountain Way, Nine Immortal alchemists, and the Shakunasar flesh-benders. These are in addition to the standard magic-user class, represented by the High Path sorcerers and Stitched Path vivisectionists. The new classes differ primarily in their spell selection, though most of the classes also get minor abilities, while the two variations of standard MUs differ solely in terms of flavor. Taken together, these eight classes offer a wide range of interesting options, each of which is mechanically similar while being distinct, mostly through unique spell lists and cultural/philosophical details. To my mind, this is an ideal approach to the introduction of new classes and is particularly well suited to old school games. The second chapter, "Works of Sorcery," introduces a system of research points to aid in the creation of new spells and magic items. It's a simple and open-ended system, which nevertheless provides plenty of examples and guidance for the referee in adjudicating it. What I like is that it covers everything from potions to scrolls to weapons and armor and beyond. Likewise, mentors, apprentices, and even hirelings have roles to play in the process, which gives them good reason to be included in a campaign. The third chapter, "Sanctums," covers the building -- and staffing -- of magical strongholds. It's shorter and more straightforward but just as useful. The fourth chapter, "Dark Cabals," presents a series of random tables for generating arcane academies, conclaves, and sorcerous cults. These can be used in conjunction with the "Quick Wizard Generation" tables provided in the fifth chapter, "Resources." These tables are excellent, with lots of depth and variety. A few D20 rolls and you can learn why a wizard took up spellcasting, his immediate desires, friends, enemies, clothing tastes, and more. Also provided in this chapter are quick wizard spellbooks, random arcane treasures, and random occult tomes. It's a very useful chapter, but that didn't surprise me, since Kevin Crawford's gaming products, both for Labyrinth Lord and Stars Without Number has always excelled in this area. Like most Sine Nomine products, The Crimson Pandect won't win any awards for its layout or artwork. The book uses a simple, two-column format and is sparsely illustrated with a combination of clip art and some original pieces. However, it's well written and imaginative and, most important of all, useful. This is a product that can be easily used in almost any old school fantasy campaign, though its new classes probably work best in the context of the Red Tide campaign setting. 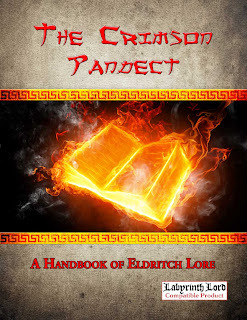 If The Crimson Pandect has a "flaw," it's that it's a very focused product and is thus likely to only of immediate interest to those who want to expand the scope of magic and spellcasting in their campaigns. It's wholly supplemental, too, even to Red Tide, so there's is no necessity in purchasing it, though I think the new classes, research system, and resources alone make it worth a look, if only as a source of ideas. Buy This If: You're looking for rules and ideas to expand the options of magic and spellcasting in Labyrinth Lord or other old school class-and-level games. Don't Buy This If: You're not interested in new magic and spellcasting options. James, have you ever published your heavily modified Labyrinth Lord rules? I would be interested to see what you do to your game. I liked this supplement. But then Kevin is on my automatically must buy list and has been for quite some time. The only thing I'm tempted to do is reduce the spell selection for High Path Wizards to match those of the other schools in number. Perhaps adding the remainder as Low Path, or balkanizing the High Path by splitting the knowledge in a number of tomes - like a Military Manual of Magics for military mages. I've not published them, but I intend to do so at some point in some form. I'm a poor judge of how much stuff like this interests people, so I've held back on releasing it. Maybe you could do a series posts here on your blog.